Sunbelt Staffing explores the figures behind the country’s 2022 healthcare time bomb. 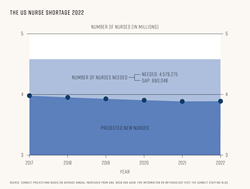 America will need 1.1 million new nurses by 2022 , but research from nursing recruitment experts Sunbelt Staffing has projected that without sweeping change, only 462,383 new nurses will be available, creating a shortage of just under 700,000. While there are currently 3.97 million active Registered Nurses  in the country, by 2022 this number may have dropped to 3.89 million, due to a projected 500,000  retirements from an aging workforce and an education system struggling to cope with demand. This nursing shortfall is in stark contrast to overall population rises, specifically a rise in people aged 65 and over. On average, this demographic cost hospitals up to three times more ($18,424) than working-age individuals ($6,125)  and are predicted to top the 60 million  mark in five years’ time. While the number of new foreign nurses taking the NCLEX qualifications needed to work in the country peaked at 33,768 in 2007 , (with pass rates at around 50%), last year the number was only 11,569, with only 4,495 passing and able to work. New legislation by the current administration on the availability of H1-B visas  may make the influx of foreign nurses even lower. For more data analysis and graphics, including analysis of huge rises in federal HRSA grants  given to nursing programs since 2008, visit the Sunbelt Staffing blog at blog.sunbeltstaffing.com. For more information and comment please contact Laura.Wrightson(at)searchlaboratory(dot)com or +441132121211. Projections made by Sunbelt Staffing using current nursing numbers from NCSBN, average graduate numbers (and average annual increases) from the AACN combined with projected retirements from the ANA and estimated annual influx of foreign nurses based on average pass rates of foreign nurses taking NCLEX examinations. To learn more about Sunbelt Staffing, please visit sunbeltstaffing.com. To see Sunbelt Staffing's current job openings, please visit sunbeltstaffing.com/jobs.